One of the joys of multiple-image photography is the many different methods that are available to the artist, from the brilliant picture-on-picture images of John Stezaker to the complex panographs of Mareen Fischinger and the still movies of Noel Myles shot from multiple viewpoints, often over extended periods. Although not essential, it is a good idea to have some idea of how the final image will be built and presented. The major decision is whether or not to create a regular or irregular grid of constituent cells. For a long time now, I have been attracted to regular grid images, particularly Noel Myles images and Hockney’s early polaroid joiners. I’m interested in the way the grid encourages the eye to scan and rescan the image, building up a visual memory. Noel Myles’ term still movie is very appropriate; viewing a row or column of cells in a regular grid has the effect of viewing a strip of movie film. As Hockney said about his polaroid joiners “... you can go on and on looking at these pictures...” To my eyes, irregular grids do not have such a strong guidance or hold on the eye. The eye will pick out details, but seems to spend much of the time viewing the composite image as a whole. Last week when I was out photographing at Barton Farm, I took the opportunity to make both regular grid and irregular grid joiners. I posted the regular grid joiners from this session last week. As I said early, I wanted to concentrate on the details of harvest, primarily the small things left over after the field was cropped. I used the Olympus 45mm lens at shallow depth for most of these pictures so that I could control the primary focus of attention for each constituent cell. 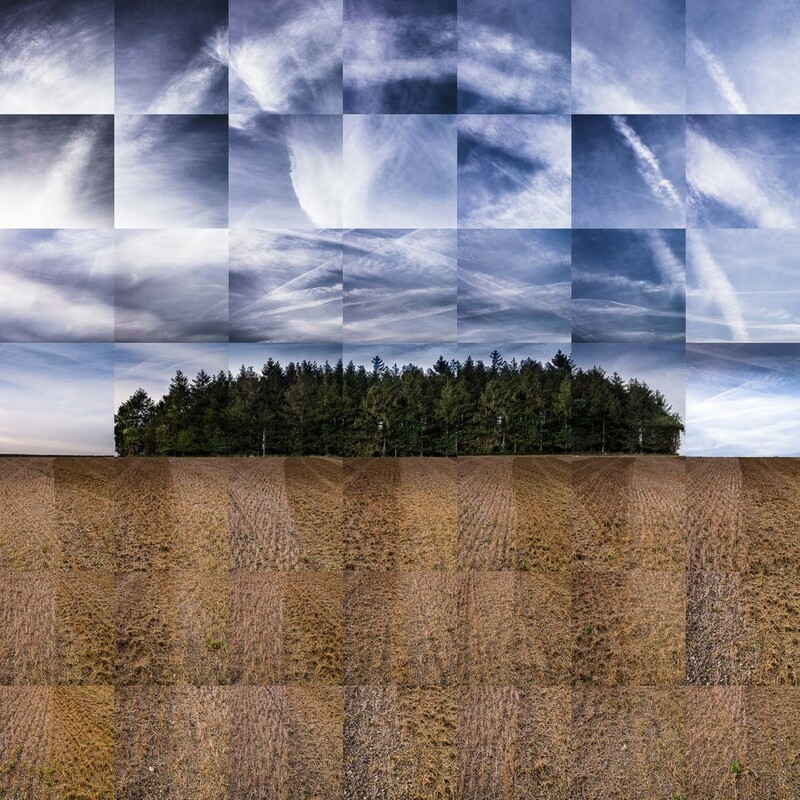 For the irregular grid, the intention was to have a selection of images that had plenty of overlap for compositing, and that the overall picture would be built up of cells with partial opacity to allow a seep through of information from cell to cell. Because of this all shots were with the camera set on manual, with an exposure set so as to avoid overexposing highlights (ie the sky). From then, it was a question of taking as many pictures as quickly as possible before the light changed, slowly working along the line of uncut barley, moving a few inches at a time to get a stretched perspective and multiple viewpoints. Photographing up close and at shallow depth of field, I chose different points to focus on to give movement to the eye in the final composite. In all, I took 55 constituent cells, and it would not have harmed to have had more. Having grown up with precious film and manual winder levers, free and easy shooting does not come naturally. I shot all the images at full resolution in RAW. I knew that this was more resolution than I need, but it is simple to make batch changes to resolution and other image settings in Lightroom, and shooting in RAW gives much more flexibility than shooting in jpeg. The actual composition of the completed image was done in Photoshop, with each cell on a separate layer of about 75% opacity, which allows precise alignment to adjacent cells. It is not a quick process assembling the final image, which took around three hours in total. I need to get this photo printed reasonably large now so that I can get used to looking at it. My wife said that on screen, the image looks rather like an ordinary photo, and I have to agree. I hope that the printed image reads a bit better.